I have just been finishing off at work for lunch the remains of the smoked salmon, dill, and red onion omelette I made on Sunday. It is a good thing too, as I needed to be reminded of some of the ingredients I had used in order to write this up. My cooking approach is best described as ‘freestyle’ – whilst I am always certain of what the main ingredients are going to be, I am generally quite spontaneous when it comes to adding other flavours and ingredients. I constantly adapt, chop and change. Whilst I am a huge fan of my cooking book collection, it is very rare that I follow everything to the letter- I will substitute and amend on the fly as I see fit. In the past, I used to ensure that I had everything in the ingredient list which resulted in having more of certain things than I needed – and less of a good thing when perishable or have a short shelf-life. This recipe is a prime example. On Saturday, I made Smoked Salmon and Asparagus bundles, and had 100g of smoked salmon left over. I also had some fresh dill, and I had a few eggs which needed to be eaten. Sure, I could have made a more traditional smoked salmon with scrambled eggs (which I do like) but definitely wanted something tasty for lunch today at work, and came up with this. Maybe I need to be more disciplined in my approach and start to write things down as I make them… sadly this goes against the grain with regard to my style of cooking. Where possible, and the lighting adequate, I will take a few photos during to act as a visual prompt. Due to time constraints though, it is not uncommon for me to cook something one day, and then only find time to write it up on www.lovethekitchen.co.uk some days later. 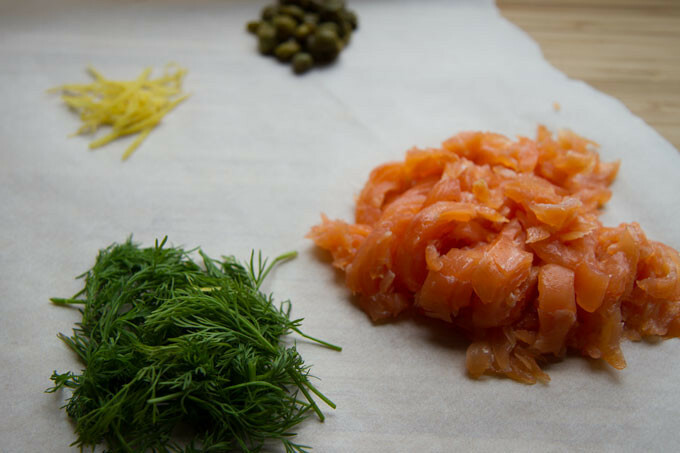 You have a lot of flavours going on here – lemon zest, capers, dill, mustard and smoked salmon. One thing certain, for sure, is that you will not need to reach out for the salt – the smoked salmon will definitely cater for the salt flavour. Slice the smoked salmon into thin shreds, zest the lemon, coarsely chop the capers and slice the red onion horizontally into thin wedges. Set these ingredients aside. Finely chop the dill, and combine it with the Dijon mustard and low-fat cream and mix well. 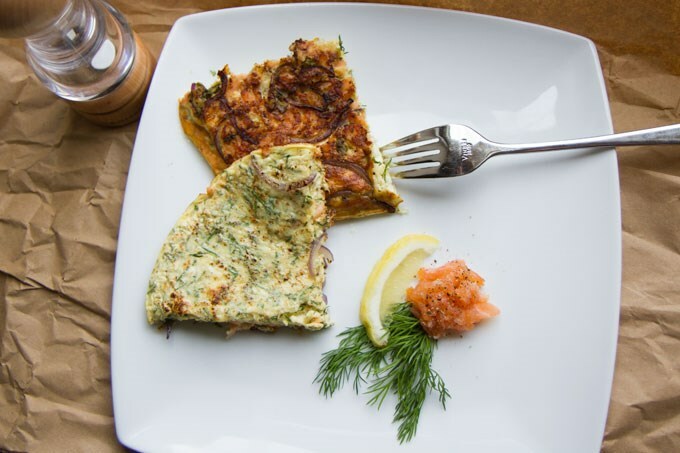 In a medium-sized bowl, gently beat the eggs and add the dill, mustard and cream mixture. Grind in some fresh black pepper and mix well. Bring a large, non-stick frying pan to a medium heat, and add the olive oil and butter. As they start to heat up and melt, add the onion, lemon zest and dill and cook until they start to soften. Then, add the shredded smoked salmon and cook gently and mix well. The colour of the salmon will rapidly turn from a darker to softer pink. At this stage, make sure that all ingredients are evenly spread out over the bottom of the pan. Give the egg mixture a final whisk, and pour into the pan. Leave the pan on a medium heat for 3-4 minutes, until the bottom of the omelettte starts to firm up. The next step depends on if you have a chef's torch at your disposal. If you have a chef's torch, then let the fun begin. With the bottom of the omelette still cooking, fire up the chef's torch and scorch the top. Very quickly, the top will start to blister, and the liquid top will start to firm up. Continue until the top of the omelette is browned/scorched on top and firm to the touch. If you are not a budding pyromaniac like me and do not have a chef's torch, no worries. Instead, fire up the grill to a medium setting and place the pan underneath. Keep an eye on it as the top of the omelette will start to bubble and blister quickly. Once the top has a firm texture, remove.